Last week we lost Tom Wolfe, this week another literary lion, Philip Roth, leaves us. There are, of course, glowing obituaries aplenty to remind us of all the great and good novels Roth wrote. I, however, am reminded about all the books he collected, and which will now, upon his passing, make their way to the Newark Public Library (NPL) in Newark, New Jersey, his hometown and longtime muse. In our spring 2017 issue, we reported on Roth’s plan to donate his personal library of about 3,500 volumes to the NPL upon his death. (His literary papers are deposited at the Library of Congress.) Roth announced the bequest in late 2016. The library honored his gift with the creation of the Philip Roth Lecture Series, with author Zadie Smith as the inaugural speaker. But his legacy--local, national, international, literary, political--is secure. And I look forward to Roth’s library having a second life in a public space, where aspiring writers may find inspiration among his marginalia-filled books. 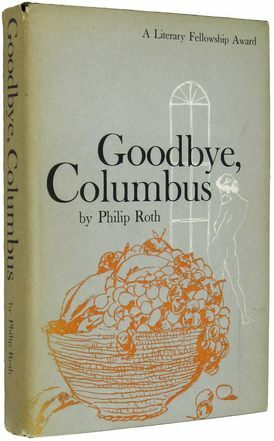 Image: First edition of Goodbye, Columbus (1959) courtesy of Ken Lopez Bookseller. Last week we lost Tom Wolfe, this week another literary lion, Philip Roth, leaves us. There are, of course, glowing obituaries aplenty to remind us of all the great and good novels Roth wrote. I, however, am reminded about all the books he collected, and which will now, upon his passing, make their way to the Newark Public Library (NPL) in Newark, New Jersey, his hometown and longtime muse. In our spring 2017 issue, we reported on Roth's plan to donate his personal library of about 3,500 volumes to the NPL upon his death. (His literary papers are deposited at the Library of Congress.) Roth announced the bequest in late 2016. The library honored his gift with the creation of the Philip Roth Lecture Series, with author Zadie Smith as the inaugural speaker. In a statement issued yesterday, the NPL shared this: "Philip Roth's passing is a painful loss to the Newark Public Library, to the city of Newark, and to the world of literature." But his legacy--local, national, international, literary, political--is secure. And I look forward to Roth's library having a second life in a public space, where aspiring writers may find inspiration among his marginalia-filled books.